Do you offer products that go out of stock periodically? Do your customers email or call you asking when these products may be available again? 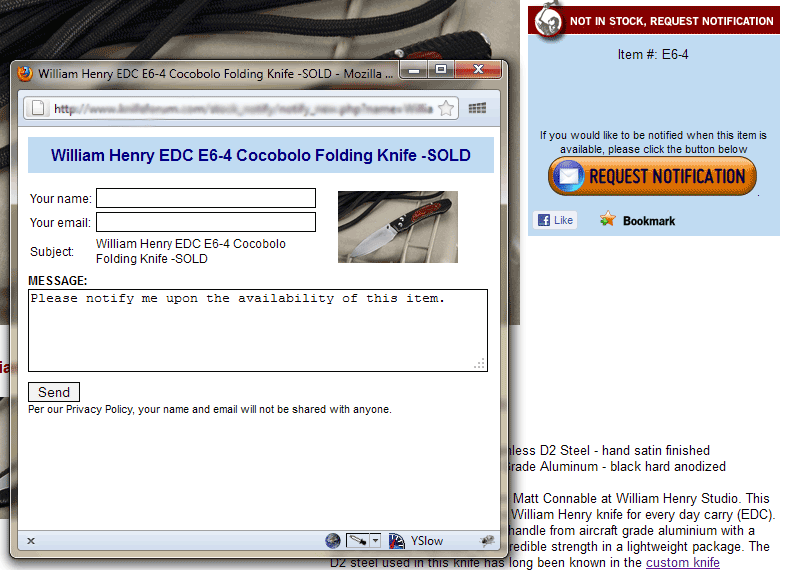 Do you use the "orderable" field to mark items in or out of stock? If you answered yes to these questions, then we have an automated solution for you that can increase your conversion on these products significantly. When a potential buyer encounters a product that's currently unavailable, chances are he/she will simply hit the back button or go to another site to try to find that product. It is almost certain they he or she will not keep checking your site to see when you have the product available. If, however, they can sign up to be notified when the product is back in stock, you can bring them to the site as soon as you have the product available. Potential customers who sign up to be notified when an item is back in stock really want that product, however, in today's day and age, nobody will keep checking back to see if something is back in stock or not. It's just too easy to go out and find the product elsewhere. When you enable your visitors to sign up for back in stock notifications, those sign-ups are almost as good as money in the bank. With the optional pre-ordering capability, you also get a yes-no switch called pre-order. When set to yes, temporarily out of stock items can still be ordered, but the add to cart button will say "Pre Order". This can be useful when an item is not immediately available but you know for sure it will be shortly or by a given time. Our "Out of Stock Notify" or "Back In Stock Notify" add-on can be installed on any Yahoo store. When you mark an item out of stock by setting the "orderable" field to "No", regular add to cart button on that item changes into a "Notify me when in stock" button. When the customer clicks the button, a form comes up asking for the customer's email address. 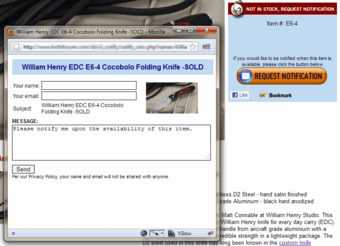 The customer submits the email address, and next time when you set the "orderable" field of the product to Yes and publish the store, the customer will receive an email telling them that the item is now available, with a link pointing back to the item. What does this add-on require? The Out of Stock Notify tool can be set up on any yahoo store, but it does require PHP and MySQL. If your store is a legacy store, then you'll need to have access to such a hosting environment outside of your Yahoo Store. If your store is not a legacy store, then you already have these as part of your Merchant Solutions package. Yes. The "update" runs automatically each time you publish your store. When the publish is complete, the catalog is checked against the customers who signed up and the emails are sent out as needed. Is there an ongoing fee associated with this? No. There is a one time setup fee, that's all. You need to have this tool, it will pay for itself many times over. Conversion rates on the notify emails are a whopping 35%. Our site, www.razorama.com, was one of the early adopters of this tool and we've earned 3000% return on it's cost. It's one of my favorite tools by far. Our sales went up 48% the first month after Y-times completed several site modifications and enhancements. Our sales have been at this new level for the past 3 months and growing.. The notification tool is great! It really fits for us because our items are hard-to-get and come in and out of stock a bunch. We are getting a bunch of people sign-up for it.